I realized I haven't written anything for quite some time, so I thought it would be a good idea to post something even if it's short just to give you an idea of what I've been up to, and get back in the habit. I have a few blog posts in the works, including an account of my experience with the grad school application process, and some thoughts on mapping and its function. I hope to find time to finish those and post them in the next week or two. This weekend I had a few days off so I got a fair amount of work done. I have been working with some land use maps in Photoshop to plan out the shapes and colors I will be using to create my linocut prints for the Rochester show. It was really nice to have full days to devote to the fussy work, instead of cramming in an hour of work between getting home from work and bed. I'm looking forward to a time when I can devote more time to developing the ideas for a show through working with the materials, but I am having an interesting time planning out all the steps I will take to assemble the pieces before I actually start. I'm ding so much planning now because I have specific materials I need to gather to incorporate into the collages I have planned, and it is taking a fair amount of research to track them down. In addition, I plan to incorporate the making of these collages into the process of the creation of my prints, meaning I can't start one piece without the other. This delay is giving me a lot of time to think about the inherent meanings and properties of the materials I plan to use, and about how planning these pieces out in full, and then assembling them is akin to a performance, with the finished product serving as evidence of the performance. From the end of that last paragraph you can see that I am doing too much thinking and not enough making, so I am glad to report that the last of my art materials that I ordered online have finally arrived. I somehow accidentally sent some paper and printmaking ink to my old address in Saint Peter, instead of my current address, but one of my former Gustavus professors was kind enough to bring it up to the cities for me after several phone calls to the Gustavus post office to track down "a small box and a really large flat box that got delivered the other day." A big part of this exhibition is source, and how maps record and influence the interactions we have with our surroundings, and I have been trying to find a particular kind of map to use in the show. The problem is I'm not sure if this kind of map even exists, and most map collections are organized by their function and date and not by the feeling you get from examining it, or what visual presence it has as an object. I've been out on several research expeditions to try and explain my needs to people and agencies who work with maps, and It's nice to be out driving and walking to this different places to examine these artifacts first-hand. I paid a visit to the Washington County Government Center, and to the surveyors office at the Public Works building in Stillwater last week. Most map records there are very functional and relate to property lines, city planning, land surveying. Most of the information that's designed for perusing is online in geographical information systems (GIS). The most recognizable example of this would be Google Maps and its interactive interface. I also visited the John R. Brochert Map Library at the University of Minnesota. 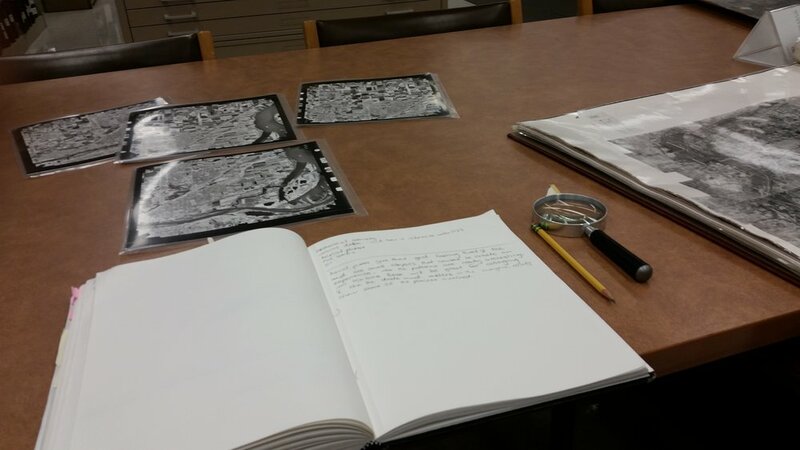 one of the student workers was more than happy to help my find a plat book for Washington County and some aerial photographs. He also gave me a few other types of maps I should consider tracking down. 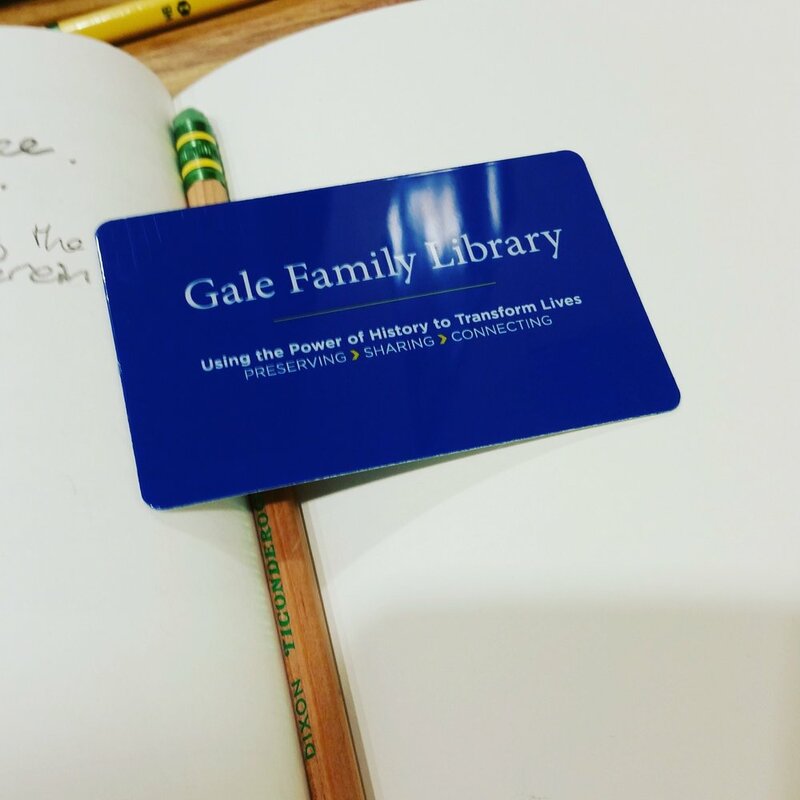 With that information I stopped in at the Minnesota History Center to visit the gale family library. I didn't find anything immediately fruitful, but one of the librarians had some information about the first surveying teams who mapped Minnesota, and clued me in to the existence of fire insurance maps that depict each block in the business districts of cities for the purposes of recording which buildings were insured against fire. All of these visits provided some interesting leads, and helped me clarify what it is I'm looking for for the show, but also made me realize how little I know about the functions of different maps and how much culture, history and politics can be unpacked from any map. 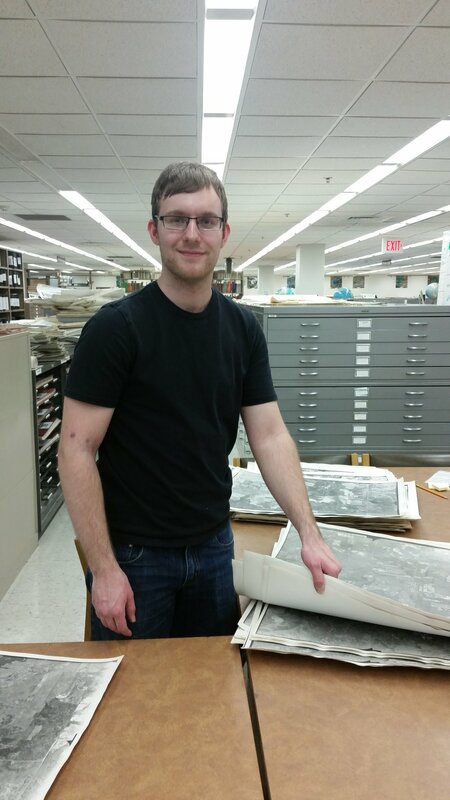 My man Nathaniel at the U of M map library was super helpful! Either a plat map or a county atlas. I can't remember which. I'll have to learn in the future.